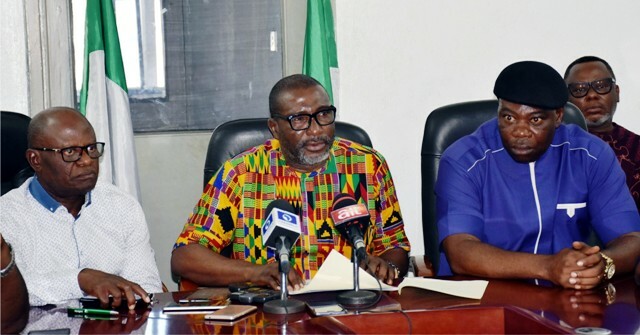 L-R: Deputy Chairman, Peoples Democratic Party (PDP), Rivers State, Mr Charles Awotu, Chairman, Bro Felix Obuah and the Secretary, Mr Samuel Okpoko, during a news conference on the 2019 Rivers State governorship election in Port Harcourt, last Saturday. The lawmaker representing Andoni/Opobo/Nkoro Federal Constituency in the National Assembly, Hon. Awajinombek Abiante, has promised to use his re-election to secure the speedy passage of the bill for the establishment of a National Fishery Research Institute at Ngo, headquarters of Andoni Local Government Area. Hon. Abiante, who said this in an interview with newsmen at Ngo also said that the National Fishery Institute was what the people of the Niger Delta needed to end poverty and restiveness. He said that the Institute when established, would help the nation to solve its challenges in the fishery sector, adding that these will not only create opportunity for the millions of unemployed youths in the region and across the country but will also boost the nation’s capacity at fish production. The lawmaker said it was unacceptable for Nigeria to continue to spend billions of dollars every year on fish importation, when the country had the capacity to produce enough fish to feed her population. Abiante also said that his second tenure in the House would be used to realise the establishment of the King Jaja Historical and Cultural Centre, while effort would be made for the upgrading of the police stations at Nkoro and Oyorokoto to divisional headquarters with the view for the establishment of an Area Police Command to ensure better security in the Federal Constituency. Meanwhile, the lawmaker has blamed the challenges witnessed in the 2019 general elections to refusal by the nation’s leadership to improve the electoral system. Abiante said that the outcry over the poor conduct of the election had justified the need for President Buhari to assent to the amended electoral bill without any further delay. According to him, electoral reforms are necessary to ensure the survival of the nation’s democracy.